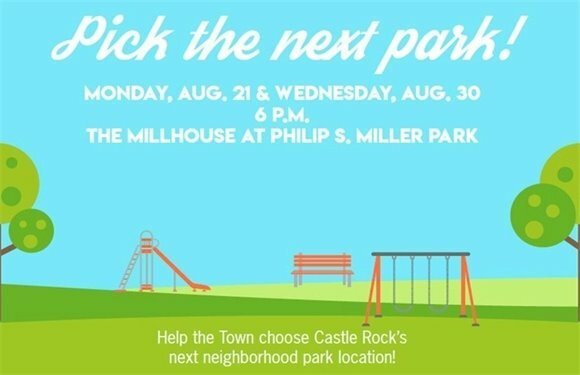 Help Choose the Next Park Location in Castle Rock! A park means so much more to a neighborhood than just providing playground equipment. It becomes a central gathering place where memories are made within the community. That’s why the Town is now asking for the public’s help picking the next neighborhood park location. Join the Parks and Recreation Department for one of two informational presentations - 6 to 7 p.m. Monday, Aug. 21 and Wednesday, Aug. 30 at the Millhouse at Philip S. Miller Park. The informational meetings will be an opportunity for residents to learn more about the research and analysis data for each potential park location. A formal presentation on each site will begin at 6 p.m., followed by a question and answer period. Light refreshments will also be provided. Feedback forms will be available at each meeting, as well as online at CRgov.com/FutureParks. Parks and Recreation staff will include the public’s feedback into a final recommendation for Town Council. The department anticipates spending about $2 million to develop five to eight acres of parkland. It’s important to note that the funding source for new parks is different than the funding sources for renovation and maintenance of existing parks and recreational facilities. Funding for the new neighborhood park was generated by park impact fees, which by state statue can only be used for new development of parks and recreation services as demanded by growth. Can’t make the meeting, but still hoping to share your opinion? Fill out a feedback form online at CRgov.com/FutureParks. Please take the time to look through the research on each site before making your selection and filling out the feedback form. The online form will be available through Sunday, Sept. 10.